You could pray for anything. Right? 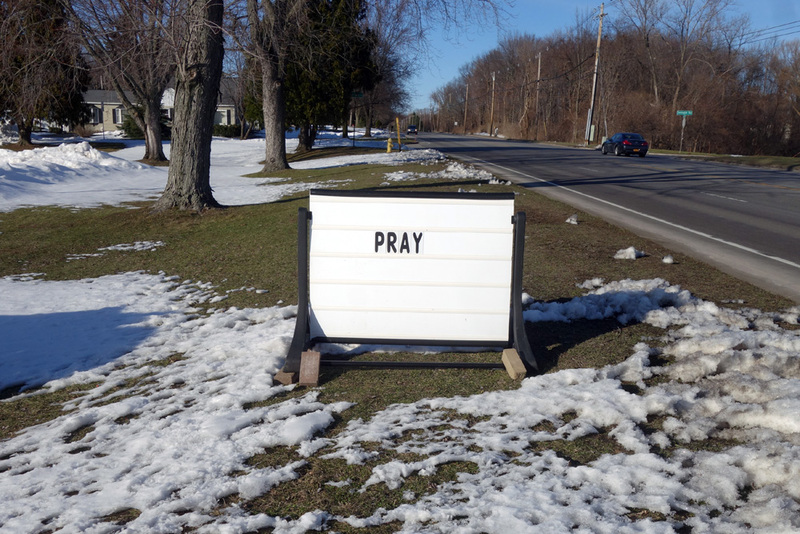 My mother, somewhat of an activist, would say, “I wish they would stop praying and do something.” We walked by this sign on Bay Road in Webster this afternoon and I thought of her. Each day for the last month Peggi has plotted a loop for us to walk. If we are out somewhere in the car we’ll start from there but most often we start at our house. And we like to head out in one direction and come back via a different route. We have been inching our way up over ten miles a day and hit twelve the last few. We’ve gone down every road on this side of the bay. The roads reach the bay and then either dead end or come back up again. There is no road that runs continuously around the bay and we have been dreaming about walking around the bay but it just didn’t seem possible. Today, Peggi suggested that we do it. Goggle plotted us straight down Culver to Empire, across the top of the bay and up the hill into Penfield to Bay Road. We stopped at Flaherty’s Three Flags Inn and split a pint of “Space Kitty,” a local IPA. A little further down the road we saw a sign sign that said, “Welcome to Webster Where Life Is Worth Living.” The sign was in the exact spot where the sidewalk ran out. Bay Road is is two lanes in either direction and it is decidedly not pedestrian friendly. We walked against traffic on the shoulder and kept jumping up in the snow to get out of the way. Things settled down once we hit Lake Road and the walk across the spit of land between the lake and bay was beautiful at sunset. We stopped again at Shamrock Jack’s and had a pint of Ithaca’s “Flower Power” to celebrate our successful fourteen mile circumference. FC Salzburg vs Borussia Dortmund was on the screen behind the bar and the score was 0-0. You better research access to IPAs every 15-20 miles along your planned pilgrimage route.